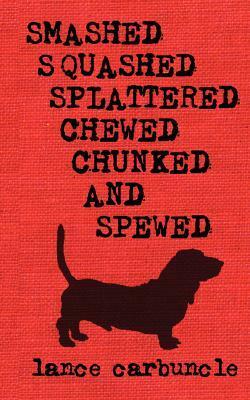 Who wouldn’t want to pick up a book titled Smashed, Squashed, Splattered, Chewed, Chunked and Spewed? With an eye-catching moniker like that, the reader must know they are in for a wild ride, which is an assumption that plays out correctly. Lance Carbuncle, in his debut novel, aims for the crazy-land target and hits it dead on. There is so much going on in this book that it is at hard times to keep track of the trajectory, and yet, the narrative always circles back to a thirty-five year old basement dweller and his creatively named basset hound, Idjit Galoot. From dreams of a runaway talking dog to an exploding sombrero, this book is just meanders down wacky lane from start to finish. It is definitely not a good pick for those who are easily offended, as it doesn’t take many chapters to encounter possible necrophilia, poop in freezer bags and enough drinking and pot to keep college freshman entertained for a month. But, if such adventures don’t turn you off, this book is darkly comedic and entertaining. I have to admit that Idjit Galoot quickly became a major selling point for me. I don’t think I would have stuck with the book to the end without the odd little basset hound whose existence creates the whole purpose for this ridiculous quest. While I have friends who might love the crazy wanderings of this verbosely titled book, but in the end, it wasn’t the tale for me. I appreciate dark humor and can giggle at crude jokes as much as the next guy, but it was just too out there for me. I think the point I really got lost was after the hurricane hit south Florida and the follows some bayou-dwelling taxidermists and their hunt for the skunk-apes.